In this laboratory, we will review the metric system as it applies to laboratory science, and learn how to use some basic laboratory measuring equipment by preparing a cupric chloride or cobalt chloride solution. You will also become familiar with the compound microscope by using it to examine the ciliated protozoan Tetrahymena pyriformis. Measurements in pounds, miles and gallons are still commonly used in the United States, but the metric system, which was developed in France in the 1790’s, has several advantages over the English system and is more convenient for scientific use. The metric system uses decimals and a system of prefixes to define the measurements of a variety of parameters. Since it is based on powers of ten, calculations using the metric system are simpler than the English system. The power of 10 in the exponent column in the table above indicates the placement of the decimal point for that measurement. For example, 103 is equivalent to 1.0 x 103 and can be converted to 1000 by moving the decimal point 3 places to the right corresponding to the exponent value equal to 3. Similarly, 2.5 x 103 is converted to 2500 by once again moving the decimal point 3 places to the right. If the exponent is negative, the decimal point must be moved to the left the correct number of places. For example, we can convert 2.5 x 10-2 to 0.025 by moving the decimal point 2 places to the left. The use of exponents of 10 to place the decimal point is called scientific notation. Scientific notation is used to represent very large or very small numbers in calculations and scientific writing. It is important to become familiar with measurements expressed in metric units and to be able to convert between these units (from grams to milligrams, for example). Conversions are straightforward since the power of ten between each unit is known. Since there are 1000 milligrams in each gram, a sample that weighs 1 gram also weighs 1000 milligrams. To keep track of the decimal point, 1000 milligrams is best written in scientific notation as 1.0 x 103, mg. In the first section of today’s lab, you reviewed the metric system as it is used to describe lengths, weights, volumes and temperatures. This section contains descriptions of some of the laboratory equipment available to make these measurements. With these tools, it is possible to make solutions of known concentrations and to accurately measure portions of these solutions. In Part III of this lab, you will use some of the equipment to prepare a solution needed for Parts IV and V of the lab. You will be using several types of containers and measurement devices in the laboratory this semester. The following pages describe some of the basic tools needed in the first series of laboratories. As the semester progresses, you will be introduced to more complex equipment. Please review the following descriptions before you use the equipment today, and direct any questions to your instructor. Beakers are used to prepare solutions and can range in size from 10mL to 4L. Any volume markings present on a beaker are only approximate and are not an accurate indication of volume. Beakers are not used to store solutions. Erlenmeyer Flasks are used to prepare solutions and microbiological media. They range in size from 25mL to 6L. Volume markings on an Erlenmeyer flask are only approximate and are not an accurate measure of volume. Test tubes will be provided to you throughout the semester for experimentation. Round bottom glass test tubes will be used for making dilutions and biochemical assays. These tubes are identified by the diameter of the tube, so a 13mm test tube has a diameter of 13mm. A 16mm tube has a diameter of 16mm and can hold a greater volume of liquid than the 13mm. Centrifuge tubes can be glass or plastic, are often pointed at the bottom, and identified by the maximum volume they can contain. They are used in a centrifuge to separate biologic materials. Graduated Cylinders are used to measure volumes from 10mL to 2L. The gradations on the cylinder are an accurate measure of the volume of liquid contained in the cylinder. The liquid in the cylinder will form a meniscus as shown in the diagram below. To measure the proper volume, the bottom of the meniscus must rest on the desired volume mark on the cylinder. Serological Pipettes accurately measure volumes from about 1.0mL to 10mL using the gradations on the pipettes. They may be made of glass or plastic. Glass pipettes are washed and reused, while plastic pipettes are disposable. The markings on these pipettes are often in descending order, so to deliver 6mL using a 10mL pipette, the liquid must be drawn to the 4 mark on the pipette. To use the serological pipettes a green or blue pipette pump is attached to the top of the pipette. The blue one is used for smaller pipets (1ml or 2ml) and the green one is used for 5ml and 10 ml serologic pipettes. Never pipette by mouth. The pointed end of the pipette is then submerged in the liquid, and the liquid drawn into the pipette by turning the wheel on the pump until the correct volume is measured. To dispense the liquid from the pipette, simply depress the plunger of the pump. Some serological pipettes will dispense all liquid from the pipette tip; others are designed to retain a small amount of liquid in the tip. Remember the glass pipettes are not disposable. They should be placed tips down in the plastic pipette canisters at each bench after use. Micropipettes are used to measure volumes less than 1.0mL. They may be fixed volume or adjustable volume pipettes. You are provided with 3 adjustable volume pipettes: one for 200-1000 microliters (μL), one for 20-200 μL, and one for 1-20 μL. To use a micropipette, attach a plastic tip to the end, depress the plunger on the micropipette to the first stop, and insert the tip into the liquid you wish to measure. Slowly release the plunger taking care not to trap any air bubbles in the tip or splatter any liquid onto the pipette base. Withdraw the tip from the liquid and dispense the volume into the desired receptacle by depressing the plunger as far as you can. Be sure to keep the plunger depressed until it is removed from the liquid, or you will remove some of the material you have just measured. Used tips are discarded in the trash at your lab bench. Pasteur Pipettes are named after Louis Pasteur. They are glass dropper pipettes that require the addition of a separate bulb at the top to create the suction. Pasteur pipettes are not used to measure volume but are used to transfer liquid from one place to another. For example, Pasteur pipettes are often used to remove all the liquid from a tube after centrifugation. Top Load Balances are used to weigh solid materials greater than 1.0 gram accurately. Either a plastic weigh boat or weighing paper is placed on the balance, and the balance is set to zero (tared). The solid material is then placed in the weigh boat or on the weighing paper for measurement. When the proper amount of solid material has been added, it is transferred to a beaker or Erlenmeyer flask, solvent added, and mixed until the solid material is dissolved. Magnetic Mixers are used in the laboratory to facilitate the mixing of materials. They are particularly useful when making solutions. The mixer has a magnetic core that can rotate at various speeds. If a beaker filled with materials to be mixed is placed on the mixer and a magnetic stir bar added into the beaker, the mixer could now be adjusted to mix the material at the proper rate. The mixing will continue until the mixer is turned off. A magnetic wand is then used to remove the stir bar from the solution before it is brought to final volume. Vortex Mixers are used in the laboratory to mix materials contained in test tubes. The force of the mixing is adjustable, and the mixer can be set to run only when a tube is inserted into the mixer receptacle. The force of the mixer should be set so that the liquid in the tube forms a vortex as it mixes, and the tube containing the liquid should always be pointed away from you or your lab partner. If a tube is more than 2/3 full, a vortex mixer should not be used because the liquid will splatter out of the tube. Centrifuges are instruments that use centrifugal force to separate biological materials. You will be using several types of centrifuges this semester. Clinical centrifuges are bench top models that accommodate various sizes of centrifuge tubes depending upon the type of holder installed. Refrigerated centrifuges are used when it is necessary to maintain the biological material at a constant cool temperature and can also accommodate several sizes of tubes. Microcentrifuges are used for very small plastic centrifuge tubes called microfuge tubes. All centrifuges require that the centrifuge tube containing the biological material be placed across from a tube of the same weight. We call this “balancing the centrifuge.” Tubes cannot be balanced by filling them to equal volumes, as these may not have the same weight. They must be balanced by weight, using a scale. Practice using the 10, 5, 2 or 1 milliliter pipettes by transferring the following volumes of deionized water into 13mm test tubes. Observe the volume differences. To insure the best accuracy, it is important that the pipette chosen to measure a specific volume has a total volume close to the volume to be measured. For example, the best pipette available to measure a volume of 1.7mL is a 2.0mL pipette. Remember that many serological pipettes have the volume markings in descending order, so be sure to draw the liquid to the appropriate mark on the pipette so the correct volume is dispensed. Adjustable micropipettes are very expensive, so please take great care in using them. To use a micropipette, attach a plastic tip to the end, depress the plunger on the micropipette to the first stop, and insert the tip into the liquid you wish to measure. Slowly release the plunger taking care not to trap any air bubbles in the tip or splatter any liquid onto the pipette base. Withdraw the tip from the liquid and dispense the volume into the desired receptacle by depressing the plunger as far as you can. Be sure to keep the plunger depressed until it is removed from the liquid, or you will remove some of the material you have just measured. Be sure never to hold a pipette upside down or sideways when liquid is in the tip. Also, if you feel resistance when changing the volume setting, stop immediately and ask your instructor for help. The following website Using a Micropipette has more detailed information about micropipette use. Practice using the micropipettes by completing the following exercise. Keep in mind that this is an exercise designed to allow you to practice and test your pipetting technique. When carrying out experiments, it is always important to choose the best pipette for the volume desired. To test your micropipetting prowess and/or to calibrate your P1000, P 200, and P 20 micropipettes, first label 6 microfuge tubes (1-6) and weigh them on the top loading balance. Remember to zero the balance before weighing the tubes. Record the weights in the table below. 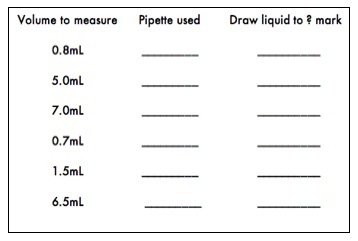 Following the table below, pipet the specified volumes into the pre-weighed microfuge tubes prepared above using either your P20, P200 or P1,000, as specified, then reweigh them. Record all weights. If the water in any tube weighs more or less than 1 gram, your pipetting technique may need revision. Repeat steps 1-3 for the tube that is off the expected weight. If your water weight is significantly off after several repeated attempts, your pipette (or your technique) may need adjustment. Ask your instructor to watch your technique and/or to recalibrate your pipette. When doing biological experiments, it is essential that the exact concentration of every solution be known. It is also important to know the pH of a solution since pH is often critical in biological reactions. Buffered solutions, which can absorb minor challenges to pH, are often used to maintain the pH of a solution. Different ways of describing the concentration of a solution as well as pH and buffers are reviewed below. 1. Percentage by weight (w/v) Solutions The number of grams in 100mL of solution is indicated by the percentage. For example, a 1% solution has one gram of solid in a final volume of 100mL solution. To make this type of solution properly, you should weigh 1.0g of the solid material and dissolve it in slightly less than 100mL of solvent. Once the solids have dissolved, you can bring the volume up to 100mL. If one liter of a 1% solution is needed, then 10g of solid would be dissolved in 1000mL of solution to maintain the 1% ratio of solid weight to solution volume. 2. Percentage by volume (v/v) Solutions In this case the percentage indicates the volume of the full strength solution in 100mL of dilute solution. For example, a 60% ethanol solution is made by mixing 60mL of 100% ethanol with 40mL of water. If only 10mL of a 60% ethanol solution is needed, then 6mL of 100% ethanol should be mixed with 4mL of water. 3. Molar Solutions A 1 molar (1M) solution is a solution in which 1 mole of a compound is dissolved in a final volume of 1 liter (1L). For example, the molecular weight of sodium chloride (NaCl) is 58.44, so one gram molecular weight (1 mole) is 58.44g. If you dissolve 58.44g of NaCl in a final volume of 1 liter, you have made a 1M NaCl solution. To make a 0.1M NaCl solution, you could weigh 5.844g of NaCl and dissolve it in a final volume of 1L water. 4. Buffered Solutions A buffered solution resists changes in pH. The pH of a solution is a measure of its acidity, and is defined as the negative log of the hydrogen ion concentration. The pH scale ranges from 0 to 14 where 0 is the most acidic, 14 is the most basic, and 7 is neutral. Since pH is a log scale, the difference between pH 5 and pH 6, for example, is a factor of 10. Buffers are used when biological samples need to be kept within a narrow range of pH to maintain activity. The enzymes involved in biochemical reactions often require a narrow pH range. This range is usually 7.2–7.4 for human and animal tissues. A phosphate buffer is commonly used in the biology laboratory, because it exhibits excellent buffering capacity in the neutral pH range. It is made up of a mixture of sodium monobasic phosphate (NaH2PO4) and sodium dibasic phosphate (Na2HPO4) dissolved in water. To prepare the solutions needed in later exercises, the 4 students at one lab table will prepare two different solutions. One pair of students will prepare 50mL of a 0.11M solution of copper (II) chloride dihydrate (MW=170.5) and the other pair of students will prepare 50mL of a 0.26M solution of cobalt chloride hexahydrate (MW=237.9). Calculate the correct weight of the material to yield 50mL of the proper molarity for the cupric or cobalt chloride solutions and record all calculations in your lab notebook. What would be the millimolar concentration of your solution? Have your lab instructor check your calculations before you weigh the material. Put on gloves before handling chemicals in the solid state. Nitrile gloves are available on the bench at the front of the laboratory. Please advise your lab instructor if you have a nitrile allergy. Using one of the top loading balances, weigh the correct amount of solid material and transfer it to a 250mL beaker. Using a graduated cylinder, add 35mL of deionized water to the beaker. Add a magnetic stir bar and mix on a magnetic mixer until all the solid material has dissolved. Remove the magnetic stir bar. Transfer the solution into an empty 100mL graduated cylinder and bring the volume to exactly 50mL with deionized water. Transfer the solution to an empty storage bottle. Label the bottle with the name and concentration of the solution, your initials, your lab section and date. Most cells measure about 1–100 micrometers (µm) in diameter. This size is smaller than can be detected by the unaided human eye; therefore, microscopes are needed to visualize cells and their component parts. The compound light microscope can magnify to about 1000 times the actual size of the specimen and can resolve details as fine as 0.2µm. In this part of today’s lab, you will learn to use the compound microscope by examining several types of cells. The microscope is covered (if there is a cover available). The illumination intensity knob is located on the right side of the microscope just below the on/off switch. It has a setting range of 1-10 with 10 being the brightest level. This knob should ordinarily be set to 7. Another way of adjusting illumination is by changing the position of the condenser lens. The condenser lens adjustment knob is located below the specimen stage and on the left side. It allows the user to move the condenser lens assembly up or down. As you move the condenser lens up, closer to the specimen, it concentrates (condenses) more light on your specimen. You will need to make this adjustment as you go up in magnification, so that you will have sufficient illumination. The condenser aperture diaphragm is located below the specimen stage on the condenser lens assembly. It is an adjustable opening, which allows you to make fine adjustments in illumination. The lever, which adjusts the size of the aperture, faces the user. By sliding the lever to the left or right, you may adjust the illumination to the correct level for your specimen. Changing the size of this aperture also affects the amount of contrast in the image. Thus, adjusting the condenser aperture involves finding the brightness level, which gives you the best combination of illumination and contrast. This is the method used most often in adjusting illumination in the light microscope. Another method of adjusting illumination is by using the field aperture diaphragm. This is mentioned here for the sake of completeness, as most light microscopes have an adjustable field aperture. 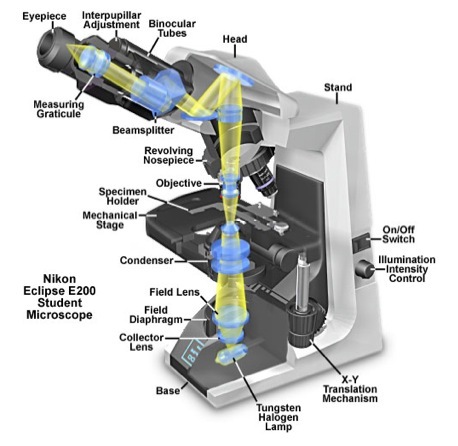 However, the microscopes in the 110 lab lack this adjustability, which allows the user to obtain illumination that is uniformly bright and free from glare (Köhler illumination). Place specimen slide on microscope stage and secure with clamping arm. The slide is properly in position if turning each of the the stage adjustment knobs moves the slide appropriately. Position the 4x or 10x objective into place. It will click when it is properly positioned directly over the slide. Make sure that there are several inches of clearance between the glass slide and the lens. Using the stage adjustment knobs, position the edge of the coverslip in the center of the illuminated area. Look into the microscope and adjust the eye pieces so that you can see one image when you use BOTH eyes for viewing. While looking through the oculars and 4x or 10x objective lens, rotate the course focus knob slowly so that the distance between the slide and the objective lens is reduced. When you see the black line that indicates the edge of the coverslip is coming into focus, switch from the course to the fine focus adjustment and bring that "black line" into sharp focus. Switch to the 10x objective and refocus. Use the stage adjustment knob to move away from the edge of the coverslip into the area where your specimen is located. Find the #To #To increase the magnification of the specimen, rotate the nosepiece to the 40X objective lens and focus using the ONLY the fine adjustment knob. Never use the coarse focus knob when you have the 40x objective in place. Although you will not use the 100x objective to view your specimens today, be aware that immersion oil must be placed on the slide in order to use the 100X objective lens. After a specimen has been focused sharply using the 40x objective, you would move the 40x objective lenses out of the way and place a small drop of immersion oil onto the slide. Then you would rotate the nosepiece until the 100X (oil immersion) lens is selected and the 100X objective lens is completely immersed in the oil (no air between slide and objective). The specimen could then be focused using the fine adjustment knob only. Never use the course adjustment when focusing a specimen with the oil objective because doing so could result in damage to the 100X objective lens or to the slide. All traces of oil must be removed from the lens before putting away the microscope. Only lens paper should be used to remove oil from the 100X objective. Total magnification of the specimen is determined by multiplying the magnifying power of the ocular and objective lenses. For example, a 10X ocular and a 40X objective together give a total magnification of 400X (Table 1). This means that the specimen appears 400 times larger when viewed with a microscope than its actual size. Cell size can be measured using an ocular micrometer. A micrometer has been installed in one of the ocular lenses of each microscope in the laboratory. It looks like a small ruler with both large and small units. The large units are numbered 1, 2, 3, etc. The small units are subdivisions of the large units and are not numbered. There are 10 small units per large unit. The small units represent different lengths depending on the objective lens in use. You will measure cellular structures in small units only, and then convert to metric units (µm = micrometers) using the conversion values below. Therefore, if you are observing a cell with the 40X objective, and this cell spans 2.5 small units on the ocular micrometer scale, then the size of the cell is calculated by multiplying 2.5 small units x 2.5µm/small unit = 6.25µm. You should always calculate size of any object that is the focus of a figure in a photomicrograph for a scientific paper. Because digital imaging allows manipulation of size post-viewing, giving the total magnification is sometimes misleading. You should calculate and give the size of any important object in the figure legend. To help you become familiar with the use of the compound microscope and to prepare for experiments with Tetrahymena pyriformis in Labs 2, 3, and 4, today you will observe live Tetrahymena. Spend some time observing the cells today, and in Lab 2 you will learn to take photographs of your cells. This week, draw them in your lab notebook. Make a circle to represent the field of view using the bottom of a beaker or petri dish and draw some represenative organisms, labeling all the organelles that you can identify. Be sure to include total magnification by every drawing. NOTE: You will not use the oil (100X) objective today to view your Tetrahymena. Obtain a microcentrifuge tube containing live Tetrahymena from the instructor’s bench. Mix it gently (no vortexing). It is best to obtain a sample from the TOP of the tube, since the cells will be more concentrated in that location. Add 20μL of the live Tetrahymena to the center of a clean glass slide, add a cover slip, and then view the cells using the microscope, starting with the lowest power and moving up to 400x magnification. Carefully observe the behavior of the Tetrahymena and record your observations in your lab notebook. If you have trouble locating the cells, it might help to adjust the field diaphragm. Place used non-disposable glass serological pipettes tips down in pipette canister to soak. Place used micropipette tips in the trash. Rinse out all other glassware with water and invert on a paper towel on the lab bench to dry. Ordinarily, the 13mm tubes are disposable, but do not discard them in today’s lab. Clean the objective lens of your microscope using only lens tissue (NOT Kimwipes®) starting with the lowest power (4x) and working up to the highest. Make sure that there is NO oil on any lens. Rotate the 4x objective lens into the viewing position. The binocular head must be rotated into the storage position, to protect the ocular lenses from damage. Loosen the setscrew on the right, rotate the head 180°, then retighten the screw. Turn off the microscope light. Have your instructor check your microscope, before returning it to the cabinet (with its plastic cover on). Place the stock solutions of cobalt chloride or cupric chloride in the tray next to the sink near the instructor’s table. Put all used microscope slides and cover slips in the glass disposal box. Familiarize yourself with the Lab wiki and bookmark it on your computer. Read material relating to course assignments and lab attendance, as well as instructions about lab notebooks in the Introduction To Cell Biology page and in the Resources section. Be sure to familiarize yourself with the safety information (also found in the Resources section). Make sure that you understand all the concepts covered in Lab 1. Solve the practice problems below on a piece of paper (NOT IN YOUR LAB NOTEBOOK!) and hand them in at the beginning of lab 2. Your instructor will grade the problems and return them to you in lab 3. Before you come to lab next time, read all the material in Lab 2 and outline or make a flowchart of the protocols in your notebook. Read about the process of endocytosis in your textbook and familiarize yourself with phagocytosis in Tetrahymena from the reference articles below. Don't try to understand all the complex science; just try to understand when and how Tetrahymena ingest particles or food. Your lab instructor will post pdf copies of these articles on your lab's Sakai site. You should bring a hard copy of the Gronlien et al. article with you to lab next time. We will spend part of Lab 2 talking about how to make effective figures from your data using some of the figures in this article as a model. Gronlien HK, Berg T, Lovlie AM. In the polymorphic ciliate Tetrahymena vorax, the non-selective phagocytosis seen in microstomes changes to a highly selective process in macrostomes. (2002), Journal of Experimental Biology 205, 2089-2097. McLaughlin NB and Buhse HE, Jr., Localization by indirect immunofluorescence of tetrin, actin, and centrin to the oral apparatus and buccal cavity of the macrostomal form of Tetrahymena vorax., (2004), J Eukaryot. Microbiol., 51(2), 253-257. In the following problems, please show all calculations, including the units. To receive full credit, make sure to answer all parts of each question. a) How many grams of sucrose (MW=342) would you need to make 100mL of a 10-2 M sucrose solution? b) How many milligrams of sucrose would you need to make this same solution? c) Express 10-2 M as a millimolar (mM) concentration. Compound Z has a MW of 100. Your lab partner weighed 25 grams of compound Z and dissolved it in water to a final volume of 1 liter. a) What is the concentration of the solution expressed as a percentage by weight (w/v)? b) What is the concentration of the solution expressed as molarity? Convert a 0.26M solution of cobalt chloride hexahydrate (MW=237.9) into %(w/v) units. b) How would you make a 5% (v/v) solution of ethanol from 100% ethanol? You need to prepare 2 methanol solutions for lab today: a) 300mL of 50% (v/v) methanol and b) 200mL of 25% (v/v) methanol. You have been supplied with 100% methanol and deionized water as well as graduated cylinders and beakers of the appropriate sizes, a magnetic stirrer and Teflon stir bars. How would you use these materials to prepare the two methanol solutions? Note that this question requires more than just showing the math involved. You need to write the steps involved in preparing the solutions, including when and how you use the provided materials. For each of the following situations, please describe what you would do. a. You just spilled Tetrahymena on your arm. b. You just finished pipetting some water with a 10ml serologic pipet. Where do you put the pipet? This page was last edited on 2 December 2011, at 13:38.